SAMCO is one of the leading Discount Brokers in India. Lets look into a detailed review, Demat Account & other features of this great broking house. SAMCO has a strong hold in capital market as full service Broker from last 20 years under formal brand name Samruddhi Stock Brokers Limited. The broking company provides a platform for trading across exchanges in India including BSE, NSE, MCX, MCX-SX, and NCDEX. Brokerage is 0.02% or Rs 20 per executed order, whichever is lower, for intraday, F&O, currency and commodity trading. For equity Delivery, the brokerage is Rs 20 or 0.2% per executed order whichever is lower. With SAMCO, you can invest in Stocks, debentures, commodity, currency, bonds and ETFs. You can easily earn by referring friends and relatives to the broking brand and become a referral associate. The distinguishing feature of the Broker includes Margin limits provided for intraday trades. Their Rating Tool is not only the first but also the only Stock Rating tools in India. It evaluates and rate companies on a variety of different parameters including market analysis, earnings, balance sheet analysis, corporate governance and others. The company provides customer support through their phone line, query resolution on website and email. The broker also provides Demat Account DP services. It offers 3 easy ways for funds transfer to Samco trading account i.e. Feature of Instant Fund Transfers through the Payment Gateway on SAMCO Trader terminal or Back office is possible. SAMCO CashPlus: it is first discount broker in India providing delivery leverage in equity segment to purchase share on NSE and BSE. Clicnts can get leverage of upto 4x on the shares bought. One needs to pay 0.05% charges on outstanding amount. Customers can use this facility for 300+ stocks listed in this category. Data bank by SAMCO: Here one can get company’s financial position/results in single page view from last few years for better decision making. 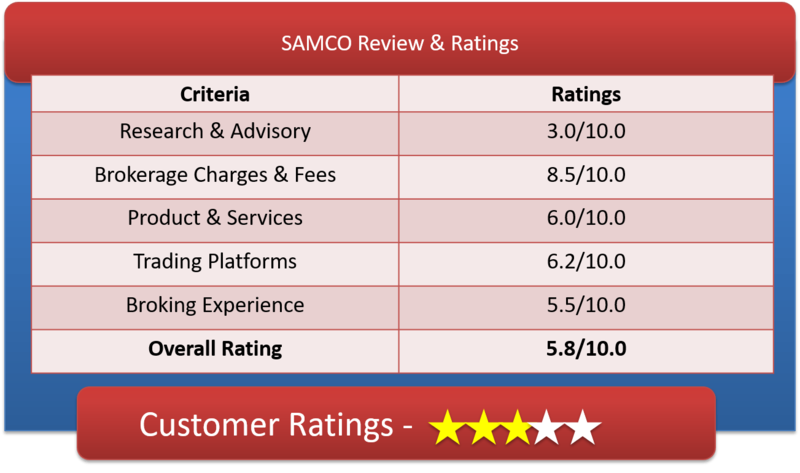 SAMCO Ratings Monitor: Helps in current decision making. Margin: In this, you can trade upto 15X Intraday equity segment leverage (MIS) ranges depending on stock. Intraday cover order (CO) trades which have built in compulsory stop loss order can have far higher leverage than the normal. The broking house levies charge of flat Rs 20/ executed order for all segments. If your trading volume is low, you can avail benefit of lower of Rs 20 or .2% (for delivery) and .02%( for derivatives) . It has no hidden charges like software usage charges and there is no Trading account AMC which is pretty much standard with majority of discount Brokers. Its Rs 20 flat-rate share trade is equal to Zerodha (Rs 20),RKSV (Rs 20),Tradejini (Rs 20) but slightly expensive than my Value Trade(10 Rs), SASOnline(Rs 9) & RK Global (Rs 9),Trade Smart Online(15 Rs), Compositedge (18 Rs) plans. Call and Trade facility is available at RS 20 / executed order with first 20 CALL N TRADE Free. The discount broking company clears with the exchanges on T day so overnight exchange margins are the lowest in the Industry. Call and Trade feature is available at an extra cost of 20 Rs per call + Service Tax, First 20 call n trade are free. Money withdrawals charges applies as per RBI guidelines. Margin for NSE Cash/BSE Cash – Upto 3X to 10X on MIS orders, upto 50X on CO Orders, Overnight/Carry Forward Orders – No Leverage. Exposure for Equity/Index Future Trading – Offers 40% to 50% of NRML Margin for MIS and Additional leverage for CO Orders. Options Buying Exposure – Don’t offer any leverage for Options buying. Exposure for Equity Options Selling – Equity Index (NIFTY, Bank Nifty and others) 40% of NRML Margin, Equity Stocks – 60% of NRML Margin. Margin for Currency Futures – 50% of NRML Margin for MIS and Additional leverage for CO Orders. Exposure for Currency Options Selling – Currency Options – 50% of NRML Margin. Margin for Commodity Futures – 40% of NRML Margin for MIS and Additional leverage for CO Orders. How to Open SAMCO Demat Account? It has Desktop .EXE Version for Windows. The broking company uses NEST as their trading platform for desktop. It offers a platform that allows for placing orders on the move and functions on all web browsers and phone. 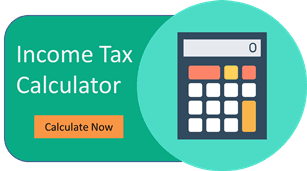 SPAN Calculator, Margin Calculator, Brokerage Calculator, Stock Ratings are some of the innovative tools offered by this esteemed broking house. The broking company is grabbing the discount brokerage industry with big advertising, strategy of initiating an investment league and promoting it with big celebrity of India like Kapil Dev. For existing traders what matters the most is the transparency, track record, customer support, trading tools, decent margin which if they are successful to provide, can sustain with champions in discount brokerage space.